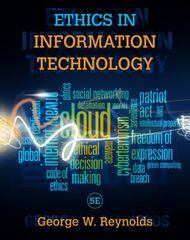 Ethics in Information Technology 5 Edition Gain a strong understanding of the legal, ethical, and societal implications of information technology with Reynolds' ETHICS IN INFORMATION TECHNOLOGY, Fifth Edition. The latest edition of this dynamic text provides up-to-date, thorough coverage of notable technology developments and their impact on business today. You will examine issues surrounding professional codes of ethics, file sharing, infringement of intellectual property, security risk assessment, Internet crime, identity theft, employee surveillance, privacy, compliance, social networking, and the ethics of IT corporations. This book offers an excellent foundation in ethical decision-making for current and future business managers and IT professionals. Unlike typical introductory Information Systems books that cover ethical issues only briefly, ETHICS IN INFORMATION TECHNOLOGY provides thorough coverage to prepare the individuals responsible for addressing ethical issues in today's workplace. You will learn how to examine ethical situations that typically arise in IT and gain practical advice for addressing the relevant issues. Up-to-the-minute business vignettes and thought-provoking questions challenge your knowledge, while features focused on decision-making--including updated Manager's Checklists--provide brief, critical points to consider in making key business decisions. Trust ETHICS IN INFORMATION TECHNOLOGY, Fifth Edition, to equip you with the understanding of IT and ethics needed for confident decision-making and professional success.